It must be the dream of every West Country art dealer - to discover a long-lost painting by an artist whose oeuvre is as much part of the fabric of Cornwall as it's cream teas, pasties and the eponymous tartan. To imagine that the canvas had been exhibited at the Royal Academy in 1929, and thereafter had been completely unseen until its 'discovery', would surely elevate that dream into the realms of pure fantasy  or would it? As incredible as it may seem, this is exactly what happened when an art dealer was preparing a collection of paintings by the renowned St Ives artist, Robert Borlase Smart, for a forthcoming exhibition of his work. 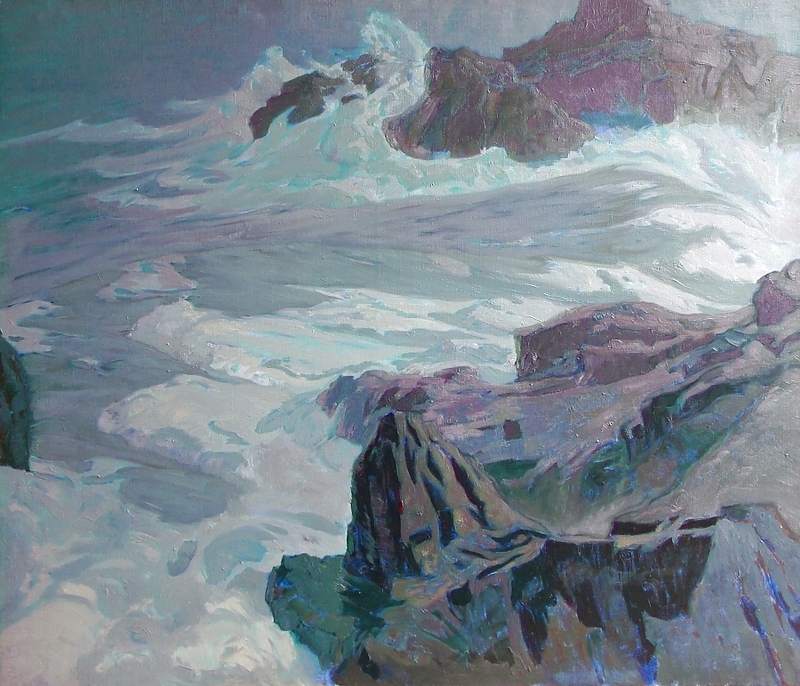 As a large oil painting of the cliffs at Land's End was being inspected in his Somerset studio, painting conservator Phil Salmon noticed that the canvas was laid over a second canvas layer. Closer inspection then slowly revealed that a finished seascape, in pristine condition, lay underneath. Art dealer, Leon Suddaby of the Sims Gallery, witnessed the remarkable discovery and was able to capture the moment in a short video clip. It occurred to him that the stretcher on which the canvas was supported was the original one, and closer examination revealed two important clues to the identity of the mysterious seascape. The date 1928 was inscribed on the wooden support, and the slight remnant of a James Bourlet consignment label was recognised, which might suggest that the painting had been exhibited (James Bourlet was a handling agent for several high-profile exhibitions, including the Royal Academy). 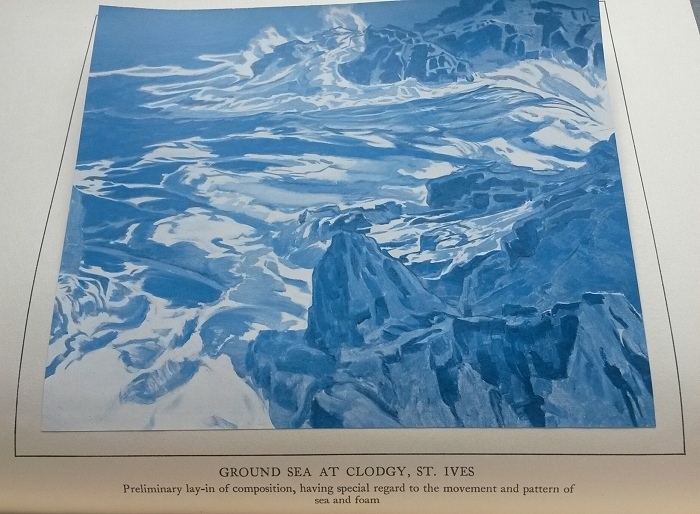 Leon decided to investigate further and it was not long before he found the painting in Borlase Smart's The Technique of Seascape Painting (published 1933), in one of many illustrations used by the artist to demonstrate the stages of painting seascapes. The colour 'tipped-in' image on page 116 (plate LV111) clearly showed the painting in it's preliminary, lay-in stage. The caption read Ground Sea at Clodgy, St Ives. Leon realised that this was almost certainly the same painting, but it only showed the initial stages of the composition, and to fully attribute the work he would need to find a record of the finished painting of Clodgy. Leon then turned to local newspaper archives to see if there was any mention of a corresponding work in or around 1928, particularly one which might have been shown at an exhibition where paintings would have been handled by James Bourlet. After a thorough search the mystery appears to have been solved when two newspaper articles revealed that the finished painting had been exhibited at the Bristol Academy (RWA) in 1928, and at the Royal Academy, London, in 1929. The work was titled "Westerly Gale, Clodgy, St Ives", and was described in 1929 as: "as fine a sea painting as you could wish for". The Clodgy painting, which measures an impressive 36 x 42, was therefore painted in 1928, used in its preliminary stages as an example in Borlase Smart's book, exhibited in 1928 and 1929 at the RWA and RA respectively and then hidden under a second canvas. The newly discovered painting is best described as a figurative work. A raw, powerful, pure seascape. The painting will form the centrepiece of the Borlase Smart exhibition at the Crypt Gallery, St Ives, from 6th to 26th September. "Westerly Gale, Clodgy, St Ives"